Agriculture is a vibrant sector of our nation’s economy, yet high barriers to entry make farming and ranching one of the hardest careers to pursue. Limited access to land and markets, hyperinflation in land prices, high input costs, farm and tax policy disadvantages, and lack of training discourage many would-be producers from entering agriculture. This is a major challenge for national food security as the average age of the American farmer is now 57-years-old, and the fastest growing group of farm operators are those 65 years and older. Despite these significant hurdles, there are dedicated people who see great opportunities in agriculture today and want to start their own farm or ranch businesses. Enabling access to land, credit, and technical assistance for new producers. Sections 101, 102 & 131 — Conservation Reserve Program Transition Incentive Program (CRP-TIP) – Amend Sections 1231 and 1235 of the Food Security Act to reauthorize CRP-TIP through 2018 and provide $50 million in mandatory funding over the life of the new farm bill. Additionally, include provisions to strengthen the conservation language, create a comprehensive conservation plan option, create an easement option through the Grassland Reserve Program or the Farm and Ranch Land Protection Program, and allow transition between family members who meet the eligibility criteria but only in the case of land sales to the younger generation. Will help retiring farmers make their land available for the next generation of farmers to afford. Section 111 — Farm and Ranchland Protection Program (FRPP) – Amend Section 1238I of the Food Security Act of 1985 to make preserving farm viability for future generations a part of the purpose of the program, and to give funding priority to easements with an option to purchase at the agricultural use value, to deals that transfer the land to beginning and farmers and ranchers, to applicants with detailed farm succession plans, and other similar mechanisms to maintain the affordability of protected farm and ranch land, keep it as working land, and foster new farming opportunities. Will help land trusts fund conservation easements that keep land affordable for working farmers. Sections 121 & 122 — Environmental Quality Incentives Program (EQIP) – Amend Sections 1240B of the Food Security Act of 1985 to continue the existing cost share bonus for beginning, limited resource, and socially disadvantaged producers within EQIP, and reaffirm the advance payment option that allows beginning and socially disadvantaged producers to receive an advance payment for the project’s costs for purchasing materials or contracting services, but increase the limit on the advance payment from 30 percent to 50 percent of costs. Include a priority on beginning and socially disadvantaged farmers within the Conservation Innovation Grants subprogram. Helps new farmers access important funding for high tunnels and other conservation measures. Section 132 & 133 – Technical Assistance and Whole Farm Conservation Planning – Amend Sections 1241(g) and 1244(a) of the Food Security Act of 1985 to increase the rate at which USDA can provide conservation technical assistance to beginning farmers, and to strengthen incentives to beginning farmers and ranchers and limited resource producers to participate in federal agricultural conservation programs by authorizing NRCS to provide them with technical and financial assistance to develop whole farm resource management system plans. Allows beginning farmer to strengthen their conservation management while also maintaining a profit. Sections 201 & 203 — Direct Farm Ownership Loans – Amend Section 302(b)(1) of the Consolidated Farm and Rural Development Act to provide the Secretary with greater discretion in determining the number of years of farm management experience required for “qualified beginning farmers and ranchers” to be eligible for direct farm ownership loans. Will help more new farmers purchase land with affordable Farm Service Agency loans. Section 202 — Conservation Loans – Amend Section 304 of the Consolidated Farm and Rural Development Act to raise the guarantee amount under USDA Conservation Loans from 75 to 95 percent for beginning farmers and ranchers, create a 50 percent target participation rate for beginning farmers and ranchers similar to the targets for other loan programs, and delete the existing provision that waives the family farm eligibility requirement which is required for all other FSA loan programs. Makes conservation loans more practical and attainable for newer farmers. Section 205 — Down Payment Loan Limits – Amend Section 310E(b)(1)(C) of the Consolidated Farm and Rural Development Act to increase the limit on the size of the land value that can be FSA-financed from $500,000 to $677,000, consistent with other FSA direct loan programs. Will help more new farmers purchase land with affordable Farm Service Agency loans. Section 211 — Microloan Authorization – Amend Section 313 of the Consolidated Farm and Rural Development Act to create a new simplified loan category within USDA’s direct operating loan portfolio to provide flexible capital through microloans (not to exceed a balance of $35,000) that shall be available to any eligible borrower, but will have special incentives for young, beginning and veteran farmers, including a lower interest rate and exempting microloans to these borrowers from counting towards their loan history term limits. Also establish a cooperative lending program to allow USDA-selected intermediaries to make microloans to eligible borrowers. Will help beginning farmers through microcredit to start a farm. Section 221 — Beginning Farmer and Rancher Individual Development Accounts Pilot Program – Amend Section 333B of the Consolidated Farm and Rural Development Act to reauthorize a matched savings program per the 2008 Farm Bill with $5 million per year in mandatory funding to jump start the program. The IDA program is to be administered by the Farm Service Agency (FSA) through pilot projects in 15 states. Helps beginning farmers build their savings to make land ownership more affordable. Section 222 — Graduation to Commercial Credit – Amend Sections 311(c) and 319of the Consolidated Farm and Rural Development Act to modify the FSA loan term limits provisions to not more than 15 consecutive years for guaranteed loans and not more than 9 consecutive years for direct loans. Will help more new farmers purchase land with affordable Farm Service Agency loans. Sections 204 & 223 — Priority for Participation Loans – Amend Section 346(b)(2)(A) of the Consolidated Farm and Rural Development Act to give priority within direct farm ownership loans to joint financing participation loans and down payment loans that involve private lenders. Also, decrease the unreasonably high minimum interest rates on these loans to make them relevant in the current low-interest rate climate. Will help more new farmers purchase land with affordable Farm Service Agency loans. Section 206 — Limited Resource Interest Rate – Amend Section 316(a)(2) of the Consolidated Farm and Rural Development Act to adjust the minimum interest rate on direct loans to low-income borrowers so that it reflects the current low-interest rate climate. Makes Farm Service Agency loans more accessible for new farmers. Section 301 — Value-Added Producer Grants – Amend Section 231 of the Agricultural Risk Protection Act of 2000 to retain the priority and the set-aside for projects benefiting beginning farmers and ranchers and socially disadvantaged farmers and ranchers, but clarify the language to make both individual farmer grants and farm business and coop grants practical and effective. Direct USDA to develop an outreach and technical assistance strategy to reach under-served states and regions. Renew mandatory farm bill funding at $20 million a year. Helps farmers with marketing, business planning and the creation of local and value-added products. Section 401 — Beginning Farmer and Rancher Development Program – Amend Section 7405(c) of the Farm Security and Rural Investment Act of 2002 to reauthorize this highly successful flagship training program through 2018 and provide with $20 million per year in mandatory funding. Also, include new priorities on agricultural rehabilitation and vocational training programs for military veterans, and food safety training. Include a 10 percent cooperative agreement alternative to higher negotiated administrative reimbursement rates. 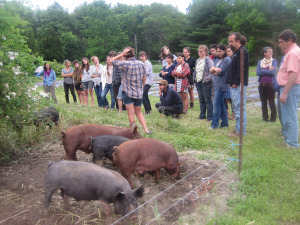 Provides important funding for new farmer training. Section 402 — Beginning Farmer and Rancher Research Priority – Amend Section 2(b) of the Competitive, Special, and Facilities Research Act of 1965 to include a new program area to support research, education, and extension projects related to beginning, socially-disadvantaged and immigrant farmers and ranchers, farm transition and entry, new marketing and farm viability alternatives, and related issues. Also clarify the authorizing legislation to ensure that all AFRI programs (including integrated) are fully competitive and open to all eligible entities. Ensures research funding is being used to help support the next generation of farmers. this partnership grant program that funds projects to inform farmers about crop insurance products and broader risk management topics. Makes crop insurance more available to beginning farmers. Section 601 — Military Veterans Agricultural Liaison – Add a new section in Subtitle A of the Department of Agriculture Reorganization Act of 1994 to create a new Veterans Agricultural Liaison position at USDA charged with facilitating the process of educating returning veterans about and connecting them with beginning farmer and rancher training and agriculture vocational and rehabilitation programs. Helps returning vets access USDA programs.